ABS brakes, Electronic Stability Control, Illuminated entry, Low tire pressure warning, Traction control. 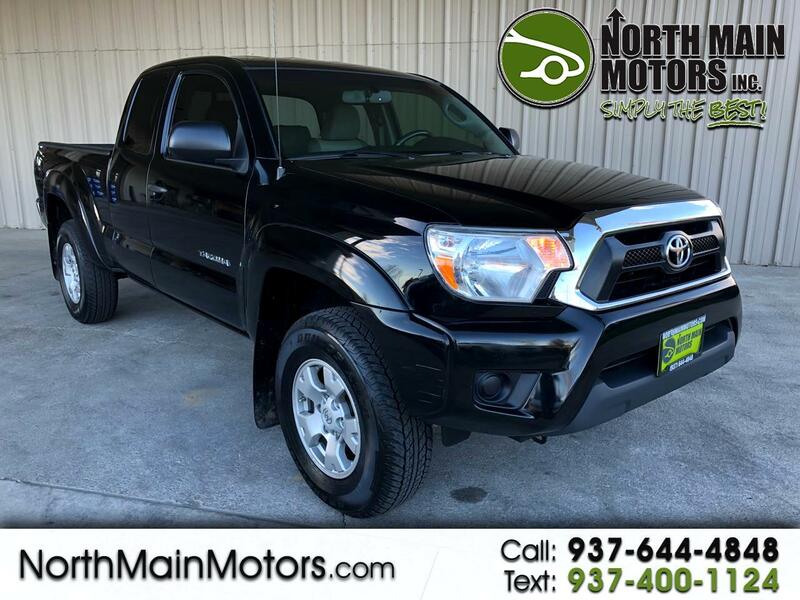 North Main Motors is pumped up to offer this terrific-looking 2015 Toyota Tacoma In Black. This vehicle is beautifully equipped with ABS brakes, Electronic Stability Control, Illuminated entry, Low tire pressure warning, Traction control, 16" x 7J+30 Style Steel Wheels, 3.727 Axle Ratio, 6 Speakers, Air Conditioning, AM/FM radio, Anti-whiplash front head restraints, Brake assist, CD player, Driver door bin, Dual front impact airbags, Dual front side impact airbags, Front anti-roll bar, Front Bucket Seats, Front Center Armrest, Front reading lights, Front wheel independent suspension, MP3 decoder, Occupant sensing airbag, Overhead airbag, Overhead console, Passenger cancellable airbag, Passenger door bin, Passenger vanity mirror, Power steering, Power windows, Radio: Entune AM/FM/CD, Rear step bumper, Speed-sensing steering, Tachometer, Telescoping steering wheel, and Tilt steering wheel! Reviews: * Choice of four-cylinder or V6 power; good four-cylinder fuel economy; serious off-road prowess; standard touchscreen; convenient size; strong resale value. Source: Edmunds * If you're looking for a compact pickup with a solid gold reputation for durability and reliability, the short list of choices will likely land you in one of the many 2015 Toyota Tacoma models. Off-roaders will appreciate the new TRD Pro Series. Source: KBB.com * Get ready to have some serious fun with the most adrenaline-inducing lineup of off-road vehicles ever unleashed, the 2015 Toyota Tacoma Pro. It has muscular curves and a rugged look, complimented by large bumpers, bulging fenders, and a big grille. The 2015 Tacoma starts the adventure with available 4WD, an electronically controlled transfer case, stability control sensors and available BFGoodrich off-road tires, to deliver maximum traction. Whether it is for work or play, the Tacoma can handle all you throw at it in a more manageable form than a full-size pickup. Offered in three cab: Regular Cab fits up to 3 people, the Access Cab seats 4, and the Double Cab with large four doors and spacious interior for 5. Each cab size can be purchased as a Rear-Wheel Drive, or with 4WDemand part-time 4WD that can switch from 2WD to 4WD and back even while the vehicle is in motion. Each drivetrain is available with an automatic or a manual transmission. The exception is the Double Cab 4x2s, which are automatics only. All Regular Cab trims are powered by a 2.7-Liter, 159 Horsepower, 4-Cylinder engine. The Access Cab and Double Cabs add an optional 4.0-Liter, 236 Horsepower V6, exclusive to certain trims. Its fiber-reinforced composite bed has better impact strength than steel. Everywhere you look, you'll find thoughtful additions like rails, rings and compartments that make loading/unloading super easy. The interior has a modern urban feel, with controls and instruments that are easy to see and use. Sit inside and appreciate its intuitive feel, that is easy to maintain and comfortable as well. Offered with four levels of Entune audio, which uses compatible smartphones to provide access to information, entertainment and navigation. Source: The Manufacturer Summary From the moment you step on our lot until the time you drive away in your next car, your buying experience with North Main Motors is our number one priority. We encourage you to use the expertise and resources of our sales staff - they are here to help you find the right car at the right price. Call us today at 937-644-4848 to schedule your test drive!